It's the first day of November, and I don't know about you, but that makes me think of lots of delicious foods, including cranberry sauce. For many people. cranberry sauce is an essential part of the traditional Thanksgiving dinner. 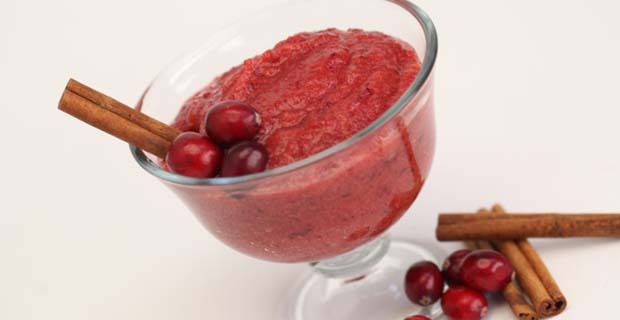 Luckily, making cranberry sauce isn't time-consuming when you use a Blendtec blender. Check out the blender recipe below to see just how easy it is. As a bonus, this recipe is perfect for nearly everyone because it's raw, vegan, dairy free, nut free, and gluten free. And it tastes delicious! Add all ingredients to FourSide jar in order listed and secure lid. Press "Speed Up" to Speed 1, and run for 10 seconds. Increase to Speed 5, and run for 35 seconds. If you want your cranberry sauce to be a little less sweet, just use prunes in place of the dates. What's your favorite holiday food? This recipe is delicious and ridiculously fast. Thank you! Can this be doubled and made in the other jar? You can make it in the WildSide+ jar without doubling it :) Happy blending!